If you are planning your next mobile app, you need a fool-proof action plan to stay the course and create an app that meets your customers’ needs. While you may strive to get it right in the first shot, developers often make fatal app development mistakes that ruin the entire mobile experience for its users. Since mobile apps are a utility for companies these days, (You may also like – How Mobile Apps have engulfed our lives ) it is so critical for them to answer the deepest concerns of your users and solve their challenges. If not, your audience leaves your mobile app barren and unused. Arm yourself with the right mobile app development tools, technologies, and tactics. 1. Lack of market and audience research – If you have a buyer persona that dates back to the 80s (sarcasm intended), you may want to look at it again. With buyer demands and needs changing at lightning speed, buyer personas need updates too. After you successfully update your buyer profile, you need to reach out to your audience and gain an unbiased understanding of their pain points. Do they need this app? What would be the value of this solution for them? What are the features they expect you to include in the app? Without comprehensive market research, an app goes right from the deployment phase to the barren land phase. 2. Including too much noise – Brands often want to include everything they can in a compact mobile app. While that may seem like the right thing to do, most successful mobile apps have one thing in common- they are simplistic and solve one specific problem. Mobile apps are a way for you to streamline an experience for your users. You may be overwhelming them with a bunch of features they don’t appreciate. This mistake links back to the first one- where you found out what was important for your users but you stuffed it all up in a single mobile app. 3. Not testing it enough – The mobile app market is highly competitive- needless to say so as Android users had to choose between 2.1 million apps in the third quarter of 2018 (Source: Statista). Some companies still make the mistake of not testing their app before releasing it to the public. The quality of your app is important as it speaks for your brand. Stimulate a positive growth for your company by extensively testing your mobile app for usability and experience loopholes. 4. Releasing single-platform apps – With the wide outreach of apps, most companies today prefer cross-platform mobile app development. Since iOS and Android cover the maximum market share, it becomes easier and desirable for businesses to develop and release apps on both platforms. Users are changing mobile devices rapidly and favor one OS over another. Therefore, it becomes a costly mistake to reach only half of your intended audience with a single-platform mobile app. Cross-platform app development is allowing businesses to develop apps across operating systems faster with cost efficiency. 5. Not focusing on the UI/UX – It is not enough satisfaction for users that an app meets their needs. Today, they demand experiences that are seamless, smooth and exciting. Consequently, mobile app development companies often work with UI/UX specialists to get the right experiences in their mobile apps. However, it is crucial to consider that UI/UX designing does not remain an option anymore. It is not a choice for businesses, but something users expect. Excellent UI/UX designs improve the appeal of a mobile app, making it easier and attractive to use. And, ignoring design can cost you mobile app engagement and conversions. 6. Delaying monetization planning – Monetizing an app may seem like a daunting task at first, but prioritizing it can save you hassles down the road. Do you implement a freemium app with in-app purchases or go for a premium subscription? Do you go with in-app advertising or solely focus on conversion through sales? This is your call, and the decision depends on the kind of user experience your audience would appreciate. For this, you need appropriate feedback from the market and analysis of user behavior to make the right monetization plan. 7. Scheduling no pre-marketing – A mobile app needs visibility and to get it in front of your target audience, you need to market it even before you launch it. Marketing mobile apps before launch helps businesses create a buzz around their app- making it easier for the app to penetrate market when it is deployed. Pre-marketing can be done on the social media, on Google, and other advertising platforms where your target audiences hang out. Another mistake businesses make is that they run advertising campaigns that are too wide and generic. Focus on your buyer persona and people who qualify it. 8. 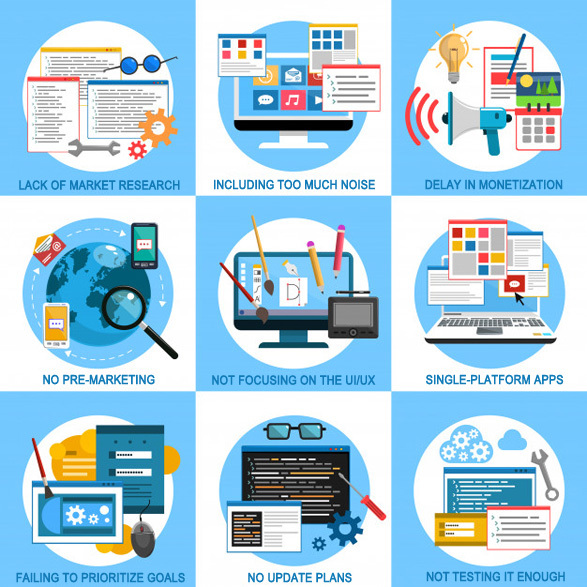 Failing to prioritize goals – Companies often build mobile apps with a fuzzy idea of how they want to benefit from it. There are two areas where most conflicts occur- downloads vs retention. Whether app downloads or app retention is your priority, you need to make sure your hired mobile app developers are aware of it. It is one thing to get people to download your app and a completely different game to make them stay. While both factors constitute the success of a mobile app, make sure you point out the first priority to your developers. 9. No update plans – Disengaged users can be brought back to a mobile app by updating it. Make sure your developers know when and how many updates you want them to work on. Without planned updates, you rob yourself of a second shot at improving customer engagement. Bring users back with updates and exciting new features, as we call it. 10. Not considering hidden costs – Mobile apps tend to have hidden costs at the beginning and throughout their life cycle. Almost all companies are optimistic about the success of their mobile app right from its launch. However, they fail to realize that they may need to shell out some extra bucks to create a buzz around their app, at least initially. These include content development, advertising, the cost of maintaining an active user base, and so on. 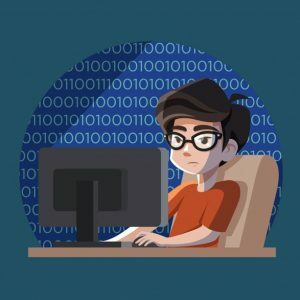 These common app development mistakes can be prevented by planning ahead of time and defining deliverables clearly and concisely to the entire development team. Most companies today prefer to outsource mobile app development to a credible IT partner. These businesses outsource app development to a company who has a proven track record of building mobile apps and driving conversion through them. While mobile app development seems like the next big step for all businesses who don’t have one, choosing the right development partner may look like searching for a needle of a certain size in a haystack. CDN Solutions Group is an award-winning mobile app development company with close to two decades of experience deploying apps for onshore and offshore clients. Let’s discuss your needs and prevent these common app development mistakes.